Before leaving for your Outer Banks vacation, please review the following pool and hot tub safety guidelines. Use common sense, and most importantly, never leave a child unsupervised. Adult supervision is required at all times and in all pools and hot tubs. Everyone at Sun Realty wants you to have a fun and safe vacation experience! Follow all posted rules and regulations. Do not go in the pool if the water is cloudy or discolored. Do not rely on water wings or other flotation devices for safety. If your children can't swim, always stay within reach of them. 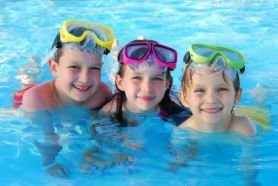 Children should never go in the pool area alone or swim alone. Never run, push, jump or horseplay in or around the pool. Never take your eyes off children in the pool, even for a moment. If you have a big group, take turns being in charge of watching everyone in the pool. When you're watching the pool, keep your full attention on the water. Avoid distractions like reading or talking on the phone. Tie up long hair to keep it out of drains. Never dive into water less than 9 feet deep. Do not use pool if under the influence of alcohol or sedating medication. Keep pool gates closed and locked at all times. Don't disarm any pool alarms that have been installed. If you find drain covers or other equipment that is broken, do not enter the pool or hot tub. Contact Sun Realty. Know where lifesaving equipment is located. Learn CPR for babies, children and adults. Never enter a pool if there is lightning. Children under 12, elderly persons, pregnant women, and anyone with any health or medical condition should NOT use the hot tub. Don't go in the hot tub if the water is cloudy or discolored. 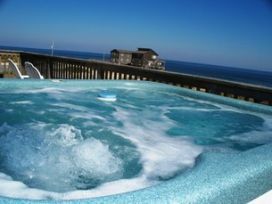 Beautiful view from the hot tub of a Hatteras Island vacation rental. Don't use the hot tub if under the influence of alcohol or sedating medication. Keep hot tubs covered and the covers locked when not in use. Don't spend more than 15 minutes at a time in a hot tub. Don't allow babies, children or pets in the hot tub. Don't get into a pool or hot tub if there is lightning. If you find drain covers or other equipment is broken, do not enter the pool or hot tub, please contact Sun Realty. In any emergency situation, immediately dial 911 for assistance.